2018 was quite a hard year; despite my resolution to slow down, I ended up doing more than ever as Andante Travel introduced its LD in Rome tours. I had to help devise them, then I produced talks and handouts before actually attending the two tours throughout – and on the second I also did a book event for my new Italian publisher. At the same time, there was more work than you may imagine, helping to create a viable Falco film script to offer to a potential broadcasting company. I was determined it should be good quality, and also faithful to the series in the various ways I am promised in the option agreement… For an author who cares this is a terrible process. At one point I likened it to sitting in a tavern listening for Blind Pew to come tip-tapping down the road to bring me the Black Spot. There were very dark moments, and I said a lot of other things too, which I shall keep to myself. There is no news at the moment, but perhaps there will be. In 2019 my resolution is… to slow down. We’ll see! It’s the year when I shall be 70 and in October it will be 30 years since the first publication of The Silver Pigs. The seventh Albia book, A Capitol Death, is now written and in production. More than that, because that story features the double triumph of AD89, I decided to write a new novella about Domitian’s infamous Black Banquet, which commentators seem to think coincided with the triumph. So Invitation to Die is also complete and will appear as a download edition shortly before the main book in the UK, and again in the USA. New contracts have been agreed for two more Flavia Albia books, numbers 8 and 9, in both the UK and US. I have started to write the first. However, I am doing my best. I have a Personal Trainer (Marcus) and sometimes even remember to go for my sessions at the right time. I watch TV programmes about exercise, while eating my dinner and sipping wine. I sleep, I go on irritable rampages, I don’t hear the doorbell if I am in the bath, I am a classic pensioner. 81 should be a doddle. I have good news for American readers, who have been asking me about books in the Falco series that have been unavailable to you for much too long. Since it seems no USA publisher wanted these books, we have now licensed ebook versions of five missing titles to Hodder and Stoughton; the digital editions will become available to America in or around April 2019. Audio editions are already available in the States. A French company, Libella, has been licensed to reissue as ebooks the Falco novels that were previously published. My Spanish publisher, Ediciones B, has asked to publish further books and I hope my Italian publisher, Kogoi, will take more too. I am sorry we don’t have news of new translations in other countries, but it is always being looked at and I shall tell you if anything happens. Sometimes in the past we have had simple book auctions, but I want to try something different: My cupboard is overflowing with spare book copies and here’s an offer: Anyone who makes a donation of at least £10 to Fishbourne Roman Palace may then send me their postal details for a signed book as a thank you from me. Anyone who makes a donation of at least £10 to Fishbourne Roman Palace may then claim a signed book as a thank you from me. Donate at https://sussexpast.co.uk/shop/fishbourne-roman-palace-donation Please use Giftaid if you can. But NB the books come from me so you must then send an email with your address to me. I will contribute P&P, any destination, one per person, and titles only while available, mainly: Shadows in Bronze, Venus in Copper, The Iron Hand of Mars, The Accusers, Ode to a Banker, Alexandria, Nemesis, The Ides of April, Enemies at Home, Deadly Election. Ten years ago I asked for your help in a survey, so I would know what the range of my readers was. This was interesting for me, but also on occasions very useful. Thanks to everyone who took part (or took part again!) the results are here. 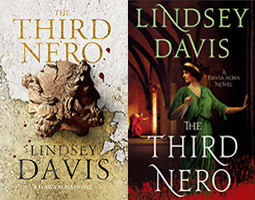 Readers choices To be memorialised on the website, send your favourite lines from Enemies at Home, The Third Nero, The Spook Who Spoke Again or Vesuvius By Night. There is more good news. In addition to Spain, Italy and the Czech Republic which I told you about previously, I am delighted that in Turkey Alfa Yayinlari have agreed to publish the first three of the Albia series. In 1997/8 I was Honorary President of the UK Classical Association. I recommend joining if you are interested in the jolly side of classics. See their website,www.classicalassociation.org. This is a personal appeal on an issue where I have experience from both sides. Please carry a donor card. And if ever you are in the sad position of having to decide whether to agree to organ donation from someone close to you, please consider the good you may do. Honour their wishes if they carry a card. If not, then it is your choice; please use the opportunity. I understand just how hard it is at the time – but I can also tell you, because I have had to do it, that afterwards you will feel glad you took the decision to say yes. Lives can be saved or dramatically improved by organ transplants. From childhood, I had a rare eye condition called keratoconus. Eventually I needed a corneal transplant – not often mentioned when organ donation is discussed, though in fact one donor can save the sight of two people. Being able to see, without discomfort, helps me to write. A stranger’s generosity freed me from years of pain and anxiety. I was never able to thank my donor or their relatives, but I shall always remember them. Every time you read one of my books, you too are a beneficiary of their gift to me. 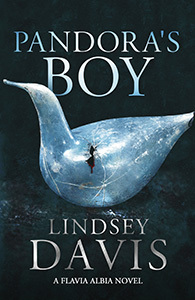 Lindsey Davis © 2019. All Rights Reserved.